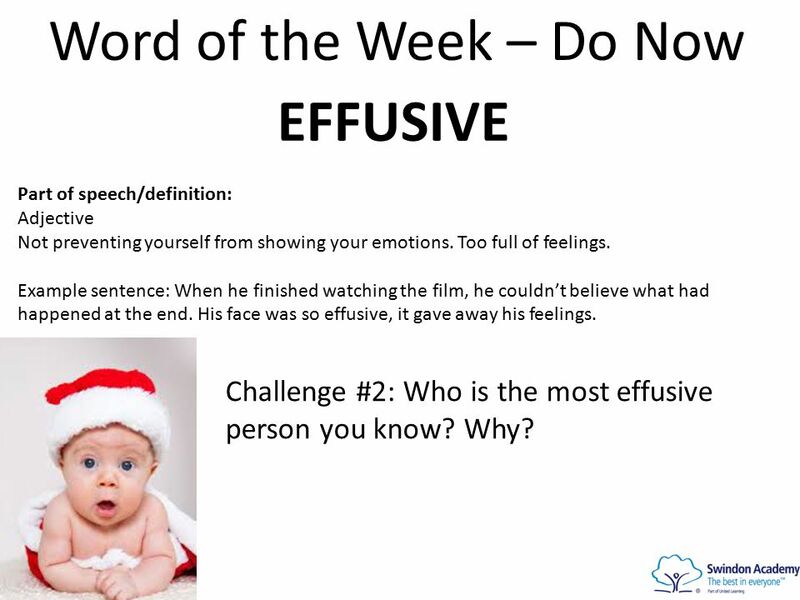 Word of the Week – Do Now EFFUSIVE Part of speech/definition: Adjective Not holding back in showing your emotions. Overflowing with feelings. Unrestrained. 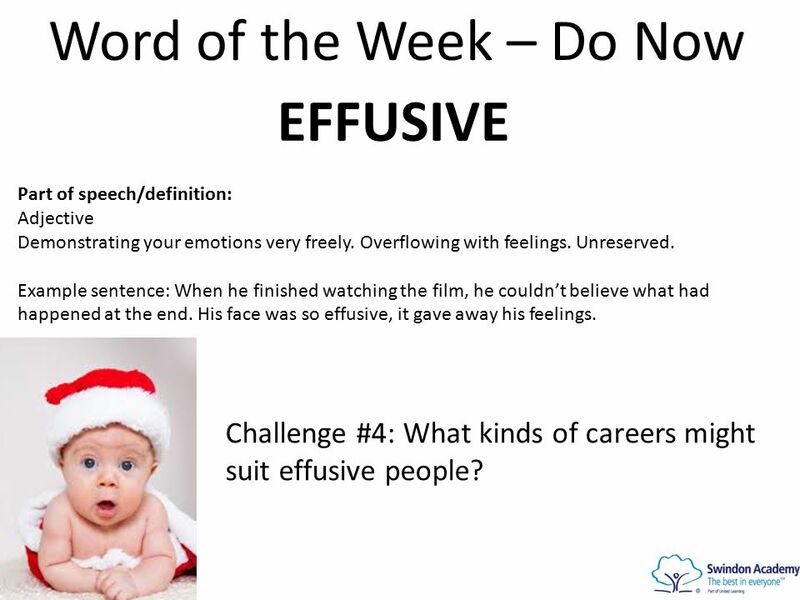 1 Word of the Week – Do Now EFFUSIVE Part of speech/definition: Adjective Not holding back in showing your emotions. Overflowing with feelings. Unrestrained. Example sentence: When he finished watching the film, he couldn’t believe what had happened at the end. His face was so effusive, it gave away his feelings. Challenge #1: Try to come up with a sentence using the word effusive to describe this baby. 2 Word of the Week – Do Now EFFUSIVE Part of speech/definition: Adjective Not preventing yourself from showing your emotions. Too full of feelings. Example sentence: When he finished watching the film, he couldn’t believe what had happened at the end. His face was so effusive, it gave away his feelings. Challenge #2: Who is the most effusive person you know? Why? 3 Word of the Week – Do Now EFFUSIVE Part of speech/definition: Adjective Unable to stop yourself from demonstrating your feelings. Example sentence: When he finished watching the film, he couldn’t believe what had happened at the end. His face was so effusive, it gave away his feelings. 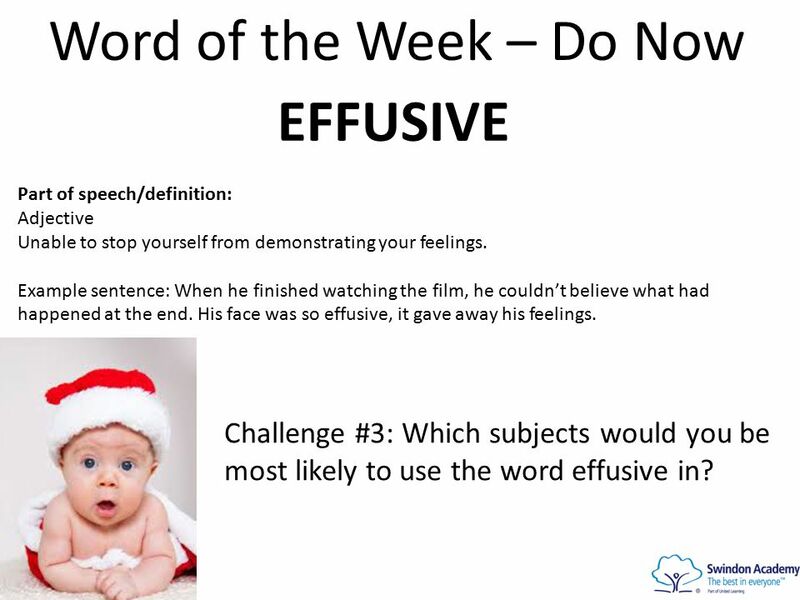 Challenge #3: Which subjects would you be most likely to use the word effusive in? 4 Word of the Week – Do Now EFFUSIVE Part of speech/definition: Adjective Demonstrating your emotions very freely. Overflowing with feelings. Unreserved. Example sentence: When he finished watching the film, he couldn’t believe what had happened at the end. His face was so effusive, it gave away his feelings. Challenge #4: What kinds of careers might suit effusive people? 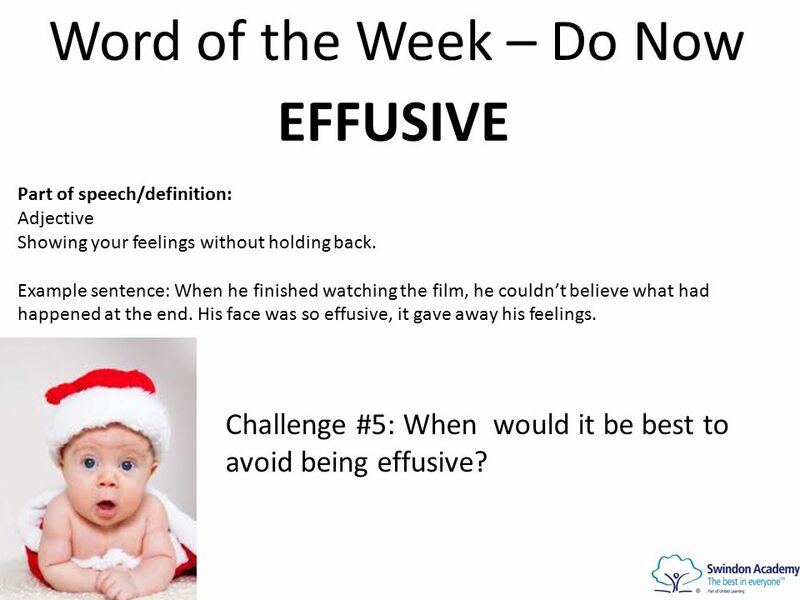 5 Word of the Week – Do Now EFFUSIVE Part of speech/definition: Adjective Showing your feelings without holding back. Example sentence: When he finished watching the film, he couldn’t believe what had happened at the end. His face was so effusive, it gave away his feelings. Challenge #5: When would it be best to avoid being effusive? 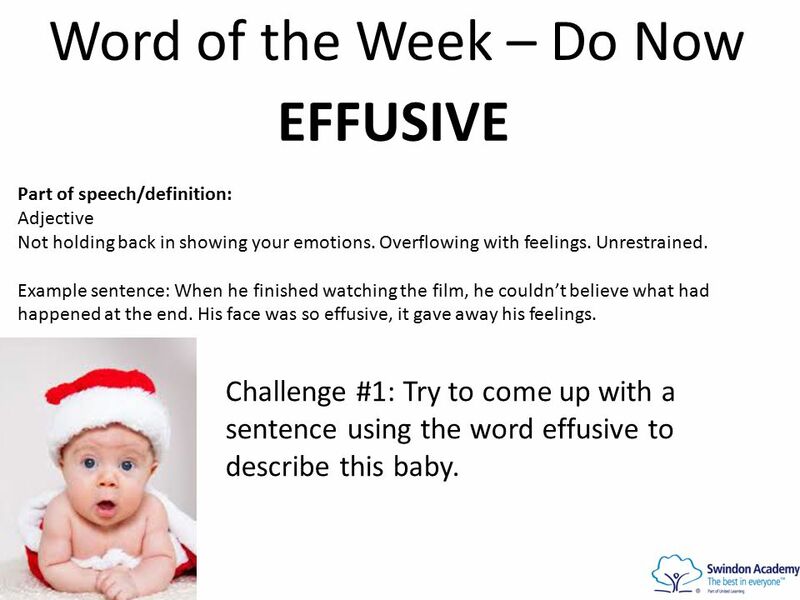 Download ppt "Word of the Week – Do Now EFFUSIVE Part of speech/definition: Adjective Not holding back in showing your emotions. Overflowing with feelings. Unrestrained." Unit 4 Reading TV programmes. Whats your favourite TV programmes Cartoons MTV Sport Drama… Do you know these programmes? weekly round-up,up-to-date interview. Public Communication Introduction to Public Speaking. DIRECTIONS: You will have the first 8 minutes of every class period to answer the questions on this PowerPoint. (If the journal is not finished during. Verbs It’s what you do, or are, or seem, or other things too, but mostly what you do. Define Adverb Modifies a verb, adjective, or another adverb. Ursula Hamner February 2,  Warm up – Phrasal Verbs  Review Articles  Word Parts  Reading Strategies  Up Front  Homework. You will be able to: Recall a definition for virtue. List and recall definitions for the four human virtues. Give an example of how each virtue was lived. Lesson objectives: To know and understand what happened at the event of Jesus’ crucifixion To understand why Christians believe it was necessary for Jesus. Adjective work 11-8 Study Skills Agenda Announcements Attendance Adjective Work. Gandhi and Leadership BY: Bailey delucia. A Review. What is an adjective? An adjective describes a noun or pronoun. It usually comes before the noun or pronoun. Click the globe beside the matching definition.